Vidyasagar School celebrated International Yoga Day was celebrated on June 21, 2017 in the school premises. The celebration began with the prayer “Samgachadhvam Samvardhvam” followed by mass yoga demonstration wherein students took part in performing various asanas that play a significant role in nurturing the body, mind and soul. 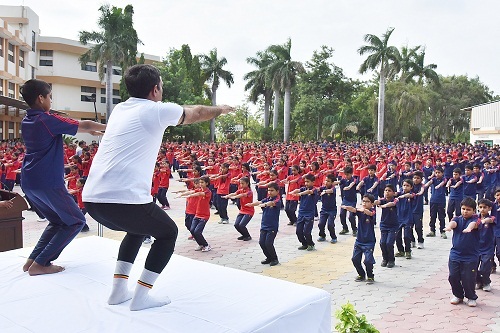 The school Principal Dr. D. C. Sharma headed the little retreat along with Yoga instructors & Students and guided the gathering by demonstrating various asanas. These asanas were taught to bring about holistic approach to health and well being among the students. The retreat took place under the sun in a yogic environment, spreading vibrant positive energy in the atmosphere. It was a peaceful and well executed gathering on an eventful day which raised the healthy & pensive quotient of the institution in a beneficial way. Celebration ended with vote of thanks proposed by the School Principal followed by National Anthem. The members of Vidyasagar and Eminent delegates of Indore were also present on this yogic day.